Annotation: Magic and a little twist of mayhem will charm fans of Sarah Mlynowski, Lauren Myracle, and Wendy Mass in this fresh, contemporary novel! When a package arrives in the mail for Cleo Nelson, she canâ€™t wait to open it. The birthday present is seven months late, but itâ€™s from Uncle Arnie and that can only mean one thing: magic! Inside is a voodoo doll complete with instructions for making happy, wonderful things happen to Cleo and her friendsâ€”err, friend. Just one, really. 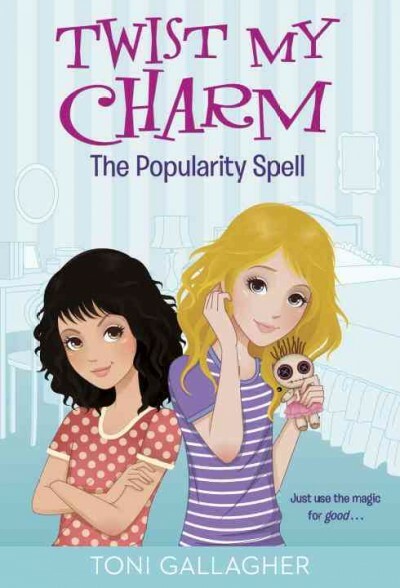 But maybe the doll can change that. . . .
Cleo canâ€™t wait to try out the magic with her friend, Samantha. They start small by wishing for treats (surprise pizza! ), but then their spells start to grow. And when they wish for popularity, they accidentally get the popular girl in school in major trouble with the principal. Can happy spells be twisted into bad magic? Donâ€™t miss Cleo next charm . . . a love potion! Contributor Bio(s): No stranger to storytelling, Toni Gallagher earned a journalism degree from Northwestern University and has had a successful career in reality TV. She began as a story editor on the early seasons of MTV’sThe Real World and was a producer on the beloved and respected Disney Channel showBug Juice, about real kids at summer camp. She serves as co–executive producer ofThe Real Housewives of Beverly Hills on Bravo. Toni lives in Los Angeles and loves finding the magic in it. Eleven-year-old Cleo struggles to fit in at her new Los Angeles private school, but when she and her best friend use the voodoo doll Cleo receives from her "free spirit" Louisianan uncle to become popular, it leads to one bad thing after another. In this series-starter, Gallagher accurately portrays the emotional experiences of middle schoolers through a unique lens of voodoo and magic.